There are not only Humans Living on the earth. God has gifted us with many other plants and animal species like birds, flowers, Plants and the list goes on. If I will ask you a question that which is the most beautiful bird on earth? It is a little hard to answer because all the birds seem beautiful and magnificent. Let me ask you one more questions which are the most strange looking birds among all bird family? There are about 10000 species of birds exist on earth. So, here we are listing the 10 most beautiful birds among all beautiful birds that are living on our earth. This is considered to be the most beautiful bird in the world. The most prominent feature of the bird is a Golden with reddish plumage on the head. The name of the bird comes from this feature only. The male Golden Pheasant is more colourful than the female ones. They are usually found in Western and Central China. Additionally known as ‘Chinese Pheasant’ mostly seen in the mountainous forests of Western and Central China. Talking about the history, the bird has been introduced to the United Kingdom around 100 years ago and there are approximately 01 – 118 mating pairs in the summer. Both male and female species have a different appearance. the male species can grow up to 90 – 105 centimetres in length, however, females are little smaller with 70 centimetres in length. Talking about the appearance, Male Golden Pheasants can be easily identified because of the bright colour and also they have golden crest tipped with red colour on top of their heads, however, Female Golden Pheasants are less colourful as compared to males. They have a mottled brown plumage and pale brown face with pale yellow feet. You should also read about the incredible and amazing arctic birds. This is a gregarious birds that means they live in small flocks even outiside the mating season. Male species forms harem of 3 to 7 females during the mating season. The bird species lay approximately 12 to 20 eggs and incubation last for 23 days. The mother or female species take care of the chicks until they learn to fly. However, females have several broods per year and sometimes it has been noticed that they adopt abandoned or lost chickens. The bird species known to have a low survival rate in the nature. They are usually found in Central and South America. It belongs to the macaw family. Parrot is very colourful. It has a red plumage with a blue back. The upper wings of the Scarlet Macaw are mainly yellow. They are also edged with green colour. The Scarlet Macaw is also listed among the most intelligent bird in the world. They can easily learn words, sounds, and tricks. Here, we have also listed about best singing birds in the world. One of the most beautiful birds in the world love to live in the rainforest. The Scarlet Macaw has a strong beak and little curved to cut crack hard nuts and seeds and a tongue that can help them to pull it from the shell. Both males and females have a similar appearance, however, some of the Macaw species love to learn but they have limited ability to mimic. The lifespan of bird species is up to 80 years in captivity, however, they can live up to 40-50 years in wild. The population of Scarlet Macaw is declining because of deforestation and illegal trapping. Talking about the appearance, The Scarlet Macaw has beautiful bright colours of green, yellow, blue and red. The largest Neotropical parrots loves to thrive in rainforest. They have a strong and curved beak to crack hard nuts and seeeds. Also, they have wings and hollow bones that helps them to reach speeds of 56 kilometers per hour. Harpy eagles, snakes, jaguars, monkeys, toucans and last but not the least humans are the greastest threats and predators of the beautiful bird species. Flaming are found on every continent except Antarctica. They used to live in large families like polar bears. They have beautifully coloured purple plumage. There are around six different kinds of Flamingo birds found around the world. The Color of the bird is usually due to the diet they take. Their diet includes brine shrimp, plankton, and blue-green algae. Also, read about highest flying birds in the world. Flamingos are one of the easily recognizable and beautiful birds in the world because of its red-purple coloured feather. The bird species love to live in mangrove swamps, shallow lakes and sandy islands mostly seen in Asia, Africa, Europe and America. It can grow up to 3.3 – 4.6 feet tall and weighs around 3.3 – 9 pounds. They have a large wingspan that ranges from 3.3 – 5 feet. The most unique feature is that they hold their breath while feeding and one of the longest migratory birds in the world can travel up to 300 miles to reach their new habitat with a speed of 37 miles per hour. Flamingos live between 20 and 30 years. The visible knee of the bird species is actually the ankle joint. However, true knee is close to the body and it is not visible because of the feathers. 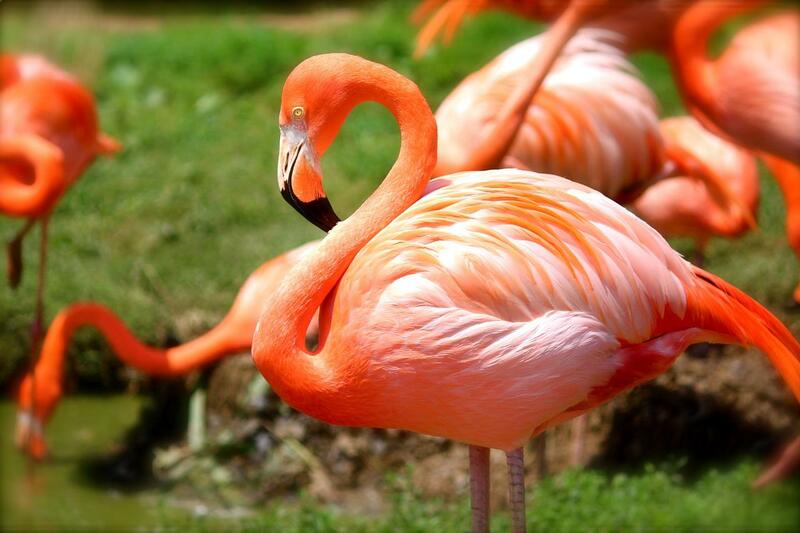 One of the beautiful species Flamingos are monogamous means they have just one partner and produce one egg each year. Both male and female species keep the egg warm before it hatches and after few days both the parents will start feeding the chick with a milk-like substance that is rich in fats and proteins. Baby bird species will hatch in the nest made of mud. They belong to the peafowl family. This family is divided into three parts namely Indian, Congo and green peafowl. Indian is the most common one around the world. The most prominent feature of Peacock is that their tail feathers used to change colours when placed at different angles. Thus depending on the reflection of light, the colour of the tail features change colour. Also, please read about the incredible and amazing arctic birds. It is also known as peafowl is one of the colourful birds in the world that belongs to the pheasant family. The bird species is native to Asia and there are two species of Peafowl, however, both of them are endangered bird species because of habitat loss, smuggling and predation. One of the largest flying birds in the world can reach up to 5 feet and weighs around 8-13 pounds. The bird’s species are omnivores i.e they can eat both plant and animals, however, they love to eat arthropods, flowers, insects and seeds. One day of baby peafowl can drink, eat and walk without any help. One of the most beautiful bird species, Peacocks are also polygamous means, it will also mate with more than one female and form a harem. The harem consists of 2 to 5 females. The bad news is that the left alone peacocks feel very sad and heartbroken. The female’s species lays 3 to 5 eggs at a time and young peacock bird species hatch after 28 days. A unique feature is a multi-coloured beak that found on these kinds of beautiful birds. This beak can reach up to 20 cm in length. They are also called rainbow billed Toucan because of the colourful beak. They are usually found in Central and South America. These birds are poor flyers because of their heavy beak. Keel Billed Toucan is also one of the most colorful birds in the world. Keel-billed Toucan is a large bird famous for its black plumage and a very large multi-coloured bill. The bird can grow up to 50 cm and weighs up to 400 gms. One of the most beautiful birds are Omnivorous, however, they mainly feed on fruits but occasionally eats, reptiles, insects and eggs. Additionally known as Sulphur-breasted Toucan is the smallest of all the Toucans bird species. The bird species prefer to stay in the lowland rainforest regions. Just like Flamingos and peacocks, Keel-billed toucan is also monogamous birds that mate between March to June every year. The female species lay 1 to 4 eggs mostly in the cavities of trees where both male and female take part in the incubation of eggs that last for 16 to 20 days. The hatchlings are blind and naked at the time of birth and both the parents are responsible for providing the food for their chicks until they become ready to leave the nest at the age of 8 to 9 weeks. The bird species reach for their chicks until they become ready to leave the nest at the age of 8 to 9 weeks. Atlantic Puffin is the seabird that is mostly found in the Northern United States and Eastern Canada. Their looks are very much similar to parrot so they are considered as sea parrots. They have also a huge and colourful bill. They have a colour combination similar to the penguin. They are also considered as excellent divers. They can also flap their wings to swim on the water and also underwater. The birds have been “sea parrots” and a large parrot-like a beak. The bird species measure up to 25cm in length and spend most of their lives out at sea and resting on the waves when they are not swimming. The unique feature about Atlantic Puffin is that its beak changes colour during the year. During the winter season, beak has a dull grey colour, however, in spring it blooms with an orange colour. They love to eat small fish such as herring, hake and sand eels. These beautiful birds come under one of the most beautiful and intelligent birds found around the world. They are usually found in Eastern and Central North America. They can copy the voice of Hawks in order to remove other others birds and steal their eggs and nest. A unique feature is the ‘jay jay’ like calls which they produce. Blue Jay birds are best known for its intelligent, beautiful and highly aggressive nature. The bird species can be 9 and 12 inches long and have the distinctive feature of the blue crest on their heads. Bluejay used to move it up and down depending on its mood. Talking about the appearance, they have a white face with the black-collared neck. The black colour extends down the sides of their heads making bills and legs are also black. Both male and female species are identical in appearance. They are basically found in the forest of North America and Eurasia that is mainly in Canada and Alaska. They nest on tree branches. They have a very nice voice so they are also called Song Birds. They have a brownish coloured body which makes them very beautiful in looks. The bird species are known for its distinctive crested heads, black masks and black throats lined with white colour. They have beautiful wings in white and bright yellow, however, some of them are red waxy appearance. It has three subspecies but all of them have a very minor difference between them. Females are similar to males, however, young birds are less well-marked and have few or no waxy wingtips. They are usually seen in North America. They create their nest in tree holes and form flocks. They are usually very beautiful because of their coloured body. They have a metallic coloured body with purplish-green head and chest. One of the most colourful and beautiful birds is one of the few species that have claws on their feet. These claws help them to perch in trees additionally known as Carolina Duck. Male species is more colourful as compared with female species. The male species come up with a green and purple head and bold white striping, however, females have grey-brown head and a brownish-green neck and body. Also, they will use man-made nesting boxes where tree cavities are scarce. They also belong to the macaw family. They are among the largest of all parrots in the world with a length of 100 cm. They are also among the one the endangered species among beautiful birds. The main reason is due to hunting and habitat loss. They are mostly found in Northern Brazil. They are also one of the most beautiful parrots in the world. They are the largest species of parrots covered with bright blue plumage, although, they have a bare yellow eye ring circles around their black eyes. They also have a yellow chin and a strongly hooked beak. The parrot species love to eat plenty of seeds and drop even more thus generating much of the forest growth. The species is endangered because of pet trade and excessive habitat loss.